We woke to a dusting of snow on the ground and some news that schools were closing because of inclement weather. Unbelievable – I’m sure it was a decision some school administrators felt really silly about less than an hour after they made it – the snow hadn’t even stuck to the street in Seattle! Luckily our school had a scheduled day off so we didn’t have to change our plans for the day. We rode to grandmas house and spent the morning with her. While we were there we got another little dusting – still no big deal but fun nontheless. The three of us rode home through the snow flurries. As we approached the last hill before home, the 7 year old jumped off the bike and decided to run – a break mom always appreciates. It’s amazing what a difference 60 pounds makes. She also gets pretty excited when she beats me up the hill. And this time she got to be the photographer – got some good shots – not bad for a 7 year old. 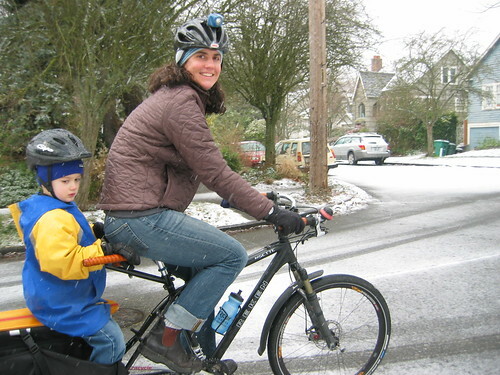 This entry was posted in bikes, kids, seattle, weather, xtracycle and tagged bikes, kids, seattle, snow, xtracycle. Bookmark the permalink. Hey surely someone has come up with a decent seat for the kids to sit on. That hard old snap deck must be pretty jarring when you hit a bump. I wonder if it’s possible to narrow the seating area a bit so their legs don’t dangle over a hard edge? Or don’t they find it a problem? My only reference is the photos I’ve seen so I’m only guessing it might be a little uncomfortable. But frankly, the kids have never complained about being uncomfortable. We always announce bumps before we roll over them and they just stand for the bump and sit back down. The footies are great for that reason. Sort of like riding a horse. Oh yeh footies? I’ll have to check that out. Yes I have a fairly rigid child seat on the back of my bike and tend to do the same. I suppose it’s probably just as hard when I hit a bump. Actually as the seat on the snap deck isn’t directly over the rear wheel it might even be less jarring than our child seat.